The warlock, as an eagle, carried a silenced rope kept close to the King of Feathers. An aging (now hasted) Tabaxi, bent on a glorious death, lead the King of Feathers on. A Tabaxi rogue/ranger nimble and fast, provided flanking support. The sorcerer, barbarian, and cleric, followed several steps behind. I wanted to reflect that moment of confusion, when a large and silenced T-Rex charges into an encampment. I told the players that each round there was a 50⁄50 chance that the rumblings of a nearby huge monster would wake any sleeping inhabitants. 6 The wizards just dealt with an incursion, roll 2d6 each, they each spent those spell slots; 1d6 veterans are bloodied. A camp of 20 or so humans has nighttime activity. I wanted to convey that reality, and not lay the conditions out ahead of time. 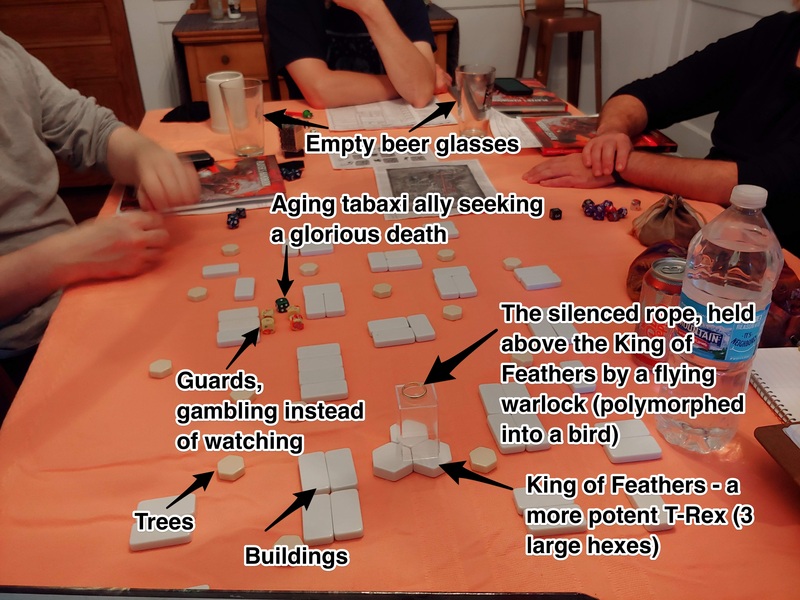 Since there were two groups of characters (those fast enough to lead the King of Feathers on, and those not) I had them roll to see how far the trailing group was behind the King of Feathers. 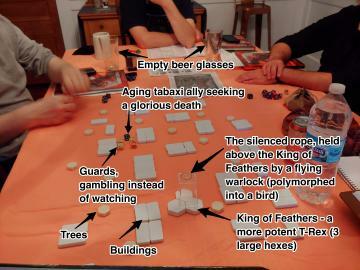 They rolled 1 round of inaction, that the guards were gambling, the faster barbarian would arrive at round 2, and the sorcerer and cleric would arrive at round 4. (They didn’t know but the veterans would awake at round 3). Everyone knew this was a dangerous gambit. Going into the session we all knew this would be an encounter that would require constant evaluation. The grand melee that ensued was among the most satisfying I’ve ever ran; Definitely the most satisfying I’ve run for 5e. But this post draws long, so I’ll save the report until next time. The Stage is Set for an Epic Battle in Omu by Jeremy Friesen is licensed under a Creative Commons Attribution-NonCommercial-NoDerivatives 4.0 International License. Based on a work at https://takeonrules.com/2018/09/16/the-stage-is-set-for-an-epic-battle-in-omu/. Permissions beyond the scope of this license may be available at https://takeonrules.com/more_permissions/.